Recently, we have spent some beautiful days in Lisbon. As our adventurous spirit goes ahead far away than our common sense, we didn't planned a tourist travel but a journey of discovery. We got a road map and went straight to Lisboa (in the way we realized that the map was outdated and there were new dual carriageway. Once we were there we bougth a city map and we found out which places we should visit, where we could rent a room, and all about public transportation in this city. What you see is not the "definitive guide of Lisbon" but "our Lisbon's guide", which I wish can be a help to future travellers. 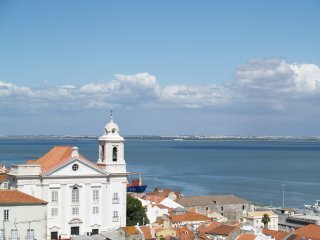 It is located in the Tagus' mouth, on the Atlantic Ocean, and it is the capital of the Portuguese Republic. It is surrounded by seven hills and the most beautiful it has got is the fog from the river that, sometimes, floods the city, and the dusking light over its historic buildings. What to see or where to start? Lisbon has got buildings of all historic ages: medieval, iron-made and crystal architecture, modernism, baroque, renaissance, romanesque. You just have to walk around with your eyes wide open. 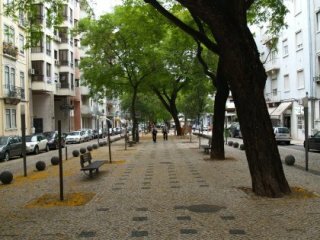 Ahead we have the Baixa with a wide area of pavement cafés and shops. This is the downtown and there are nice streets with big old buildings. This area was organised in a new system because after the 1755 Lisbon earthquake, the Marqués de Pombal designed a network of squares to be placed in Baixa, that's to say, all was rebuilt. On the right we have Chiado and Bairro Alto. The Santa Justa's elevator, that is 45 metres high, links with the Carmo Convent. At the top of the elevator we can enjoy spectacular views over the Baixa and Rossío Square. Far away on the right, in the coast it is the neighbourhood of Belem and its famous Tower, Padrão dos Descobrementos and the Jerónimos Monastery. Behind our back it is Restauradores Square, and far away, if you keep going up through the Avenida da Liberdade, you will find the statue dedicated to the Marquês de Pombal and the Edward VII park.